Women currently serving in New Jersey. Historical facts about women officeholders in New Jersey. The Lipman Chair is made possible by the generous suppport of the New Jersey Legislature. A non-partisan campaign training program to encourage women to run for elective office, position themselves for appointive office, work on a campaign, or get involved in public life in other ways. 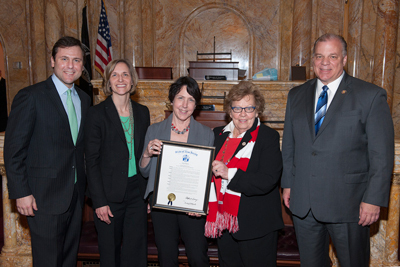 On March 14, 2016, the New Jersey State Senate passed a resolution recognizing CAWP "for its cutting-edge research and groundbreaking studies about women's routes to public office" and "numerous worthwhile programs and initiatives to educate, train and encourage women to achieve their goals and aspirations as leaders and public servants." Senate President Stephen M. Sweeney, Senate Majority Leader Loretta Weinberg and Senate Minority Leader Thomas Kean Jr. (r to l in photo) made the presentation to CAWP director Debbie Walsh and associate director Jean Sinzdak. This monograph documents the formation and activities in 1981 and 1982 of New Jersey's Bipartisan Coalition for Women's Appointments, an ad hoc group organized after CAWP convened a meeting of politically active women to discuss how to get more women appointed to state-level posts. This instructional handbook from 1978 describes the process of lobbying within a state legislative framework, listing resources from that time necessary to plan and carry out an effective lobbying campaign and explaining the legal requirements surrounding advocacy when the handbook was written.